The title translates to “Between the Planets,” and I’m happy to say I remembered enough German from high school and college that I didn’t have to run it through Google Translate to understand it. The real question is: which book of mine is it? Because I don’t remember writing a book called Between the Planets. I suspect rather strongly this is the German title for Zoe’s Tale, since I recently sold that novel to Heyne (my German publisher), and they’ve already published everything else (Android’s Dream shows up there in January). Why change the title of Zoe’s Tale, which as it happens, translates into German as “Zoe’s Tale”? Got me. These are the same people who changed the title of Old Man’s War into “War of the Clones,” and have given all my books covers with laser beam-firing ships, whether the books actually feature laser beam-firing ships or not. Mysterious are the ways of the Germans. I sell well there, however, so I’m willing to believe they know what they’re doing. That said, I believe I’m going to have to name an upcoming novel Between the Planets. Just to mess with my German publisher. What would be funny is if they retitled that one “Zoe’s Tale.” Just to mess with me. Better yet, write one called The War of the Clones: Between the Planets. As a German who has nothing to do with publishing your works in Germany, I want to apologize. Well, either that or they’re tacking nonsensical subtitles/slogans to the original titles. “Zoe’s Tale” could’ve been “Zoe’s Geschichte: Galactus Obinus Consu Shazzam” or somesuch. Isn’t Between Planets the title of a Heinlein book? I wonder what that one got called in German. Looks like the “Curse of Perry Rohdan”: Those books sold in thier millions in Germany and had spaceships and lasers on the covers, ergo………………. The irony here is that it’s the same publisher. Good thing I always buy the original version of the book anyway. Still, as long as you books don’t get published as two or more volumes (as it is customary with fantasy for some reason) in Germany you can’t really complain. Butterflies in leather. There’s an image I didn’t need. The German TV people gave all the Star Trek and Babylon 5 episodes their own names also, rather than translating the original names. When they renamed “Deja Q” to “Once again Q” I thought the French phrase deja vu was not used in German. OK. But then they renamed “Cause and Effect” to “Deja Vu.” Go figure. Maybe you should post a “fair use” part of that book from the first chapter. Many here could tell you what it is. For all we know, it might be Agent to the Stars. That makes sense as Between Planets. Well, if I had the book I would know which book it was; I can read German. Science Fiction isnt that popular over here (in Germany). Maybe because we are still busy apologizing for our history, but besides that the target audience is considered small and hard to reach. So they have to mount sharks on Spaceships with friggin Laserbeams on the cover and give it all a name that is easily related to Space and such. God, ‘Krieg der Alten Männer’ (Old Man’s War) or ‘Zoes Geschichte’ (Zoe’s Tale) would just sound /boring/ to Germans’ ears (so the publisher may think). Actually, I think SF is very popular here in Germany (as is fantasy). There’s an entire SF only used (and a few new) store here by Nollendorfplatz. And if I could read German I wouldn’t need to spend so much paying Euro for $ to buy the English version. But the Germans are quite famous for re-naming things (badly). Goes with dubbing everything rather than using subtitles, I think. Thye need to put their mark on it. BAH*! I’ve been beaten to the Heinlein reference. Perhaps you could follow up with “Glory the Road”, “Double the Star” or “Space the Cadet”. To be fair, “Krieg der Alten Männer” (War of the old men) does sound more like it takes place in a retirement home. Now that’s teasing, showing us books in German when I’m searching for a French one :p.
I am reminded, somewhat, of the way that publishers in a certain nation decided that the title Harry Potter and the Philosopher’s Stone would not go down well with residents of their nation, and so changed it to Harry Potter and the Sorcerer’s Stone. As I understand it, the problem was not that they thought readers wouldn’t understand the title. You aren’t meant to understand it; it is explained in the course of the book, and the book works better if you don’t know from the beginning what it means. The problem was that the title didn’t convey clearly enough that the book was about wizards, and they felt people needed to have that made clear to them. Publishers in another nation managed to overcome this problem without messing up the history of alchemy by calling it Harry Potter à l’école des sorciers. @19: That’s correct, but as I recall it was actually JK Rowling herself who suggested the “Sorcerer’s Stone” title. Her American agent apparently wanted “Harry Potter and the School of Magic,” much like the French version’s name. Er, apologies beforehand for being so off-topic in that last comment. It’s not off-topic. Books with changed titles is indeed rather ON topic. It sort of fits in your title homages in your other series, with Android’s Dream and High Castle, I suppose. Have any of your books been translated into Japanese? They always seem to have the funniest mistaken translations. I can imagine Old Man’s War ending up as “Green Ancestor Disgraces Others with Shooting”, or some such. Christian: Yes, I’m in Japanese. They apparently haven’t fiddled with the titles too much. Well, in that case, I guess you can save that suggestion for when you get a book with a mysterious title in Lithuanian, or Hungarian, or something else you can’t read. Good idea. A Czech version is coming up; they could insert stereo instructions into the book and I wouldn’t know. While this is obviously largely the result of the marketing suits (I mean, really: Between Planets by the author of The Clone Wars), a big part of the problem is that literary translators are paid crap. I translate from German into English and by doing technical translations, press releases, and computer games, I make 2.5 to 3 times as much as I would if I translated books. The people doing literary translations are basically the ones who can’t hack it when quality and accuracy are on the line. There are actually whole websites devoted to correcting and mocking the guy who translated all 7 Harry Potter books into German. OMW could have been Krieg der Alten or, less seriously, Krieg der Alten Knacker. Krieg der Klone isn’t really wrong. It obviously has a real connection to the story, but the attempt to tie into Star Wars is so blatant. Heh. “Krieg Der Alten Knacker” would have totally caught my eye on the shelf. “Krieg der Klone” just sounds sort of generic. I concur with the quality of translations from English into German. I started reading novels in English when I was fourteen or so, mainly because I read Stephen King’s “It” in both languages, and I was appalled at the mistakes the translator had made. These were not just translation missteps, but also totally harebrained stuff, like swapping the last names of characters, and leaving out entire scenes. Well, if you end up writing “Between The Planets”, you need to put sharks in it. Because, dammit, I want to see a cover with those laser-armed sharks I keep hearing about. You want German cover fun? Look at this Bujold cover. “Clone War” and “Between Planets”? That’s two titles they just took from other works. It’s possible that they’re doing this just because those are known titles, and they’re hoping to fool people into buying them. It seems to me that in most of these cases, the German title is actually a better description of the book than the original, or at least as good: Timeless Time; The Oracle of the Mountains; It Dies in Me. Only the first one is needlessly literal: Spaceman’s Revenge. I talked to Tim Powers a few years back, and he told a story of how, when his books were translated into german there were a few paragraphs with a different font and font size, that he didn’t recognize. Since he didn’t read german he was curious about it, and after some time finally met somebody who wanted him to sign a german copy of one of his books. He promptly asked her to read the relevant paragraphs for him. And there were no stereo instruction, but according to Mr Powers suddenly the characters started drinking tea for some reason, and they didn’t do this in the english version that he had written. The odd retitling of novels translated into German is an ongoing problem. When buying German editions of novels I enjoyed in English as presents for friends and family members, I always check the copyright page to make sure which book it is, because the titles usually don’t match and the blurbs aren’t always that informative either. “In the Garden of Iden” by Kage Baker becomes “Die Feuer der Inquisition” (The fires of the inquisition), while the Company series is called “Zeitstürme” (Time Storms). These titles are actually not too bad. The cover BTW is yet another generic spaceship, even though there are no spaceships in the novel. “Dead after Dark” by Charlaine Harris becomes “Der Vampir der mich liebte” (The vampire who loved me). Sorry, but Ian Fleming already has dibs on that one. “Vengeance in Death” by J.D. Robb becomes “Mord ist ihre Leidenschaft” (Murder is her passion) – Total miss IMO, because the German titles implies that the protagonist actually enjoys people being murdered. “Agnes and the Hitman” by Jennifer Crusie and Bob Mayer becomes “Heiße Liebe zum Desert” (Hot love for dessert) – God, that sounds like a bad erotica novel. Plus, poor co-author Bob Mayer has been all but eliminated from the cover. As for why publishers do that, sometimes the original title just translates badly or not at all. Sometimes it translates into something that is deemed too similar to another book or unmarketable (which I suspect is what happened to “Old Man’s War” and “Zoe’s Tale”). Sometimes the German publisher cannot resist making a bad pun, which is what happened to Stephenie Meyer’s vampire opus. quite substantial. Plus, certain formats of books, e.g. category romances, also have very rigid pagecount requirements. If a book does not fit these requirements, it is cut. But please don’t blame the translators for any of this. As someone above said, literary translators in Germany are paid crap (which is why I do tech stuff). And they are not responsible for passages getting cut, novels being split in two or books being given silly titles. That’s the publisher’s doing. BTW, the Bujold cover someone posted above is an old edition. The new ones have generic spaceship covers. 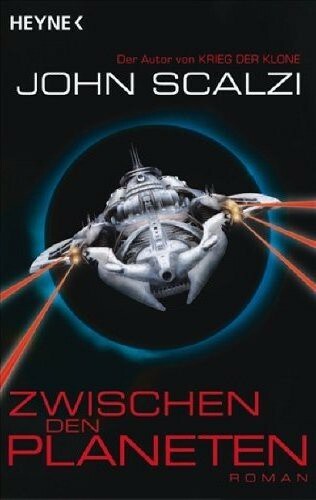 German translation of American SF material always makes me chuckle. Reminds me of the time I was visiting my family there and an episode of Star Trek TOS came on TV. The English title of this one was “Devil in the Dark” – the one with the silicon creature in the mines. Not a bad ep, but there’s a little twist to the story that was completely spoiled by the German title given at the start: “The Horta Protects Her Children” (translated to here of course). Priceless. Count yourself lucky that the translated title for “Zoe’s Tale” didn’t reveal the entire plot. IIRC in the filmed version of Harry Potter #1, the text shown on-screen does say “Philosopher’s Stone” rather than “Sorcerer’s Stone”. Philip Pullman had a similar experience (albeit without discussion) when “Northern Lights” became “The Golden Compass”, which was doubly confusing because the golden alethiometer is not a compass, and any mention of compasses in these books is with respect to the tool used to measure out the heavens. My recollection of Pullman’s account at a Seattle book-signing was that the US publishers got wedded to cover-art that misinterpreted the alethiometer and he was presented with a fait accompli. My current peeve is tracking down a local copy of Simon Winchester’s latest book, covering the life of Joseph Needham. It’s either called “The Man Who Loved China” (US) or “Bomb, Book and Compass” (UK). Winchester’s first book “The Surgeon of Crowthorne” (UK) became “The Professor and the Madman” (US). In Australia, it’s a bit of a toss-up as to which edition will appear (sometimes it’s both, as with Donald Kingsbury’s “Geta”, which I innocently rebought as “Courtship Rite”). One of Europe’s most prestigious scientific research institutes has had to issue an apology after discovering that the calligraphy used on the cover of its flagship publication to illustrate a special China edition was in fact an ad for a Hong Kong strip joint. I’m not sure I would have enjoyed OMW as much had I known about the clone thing, which the German title doesn’t exactly spoil but does heavily imply. 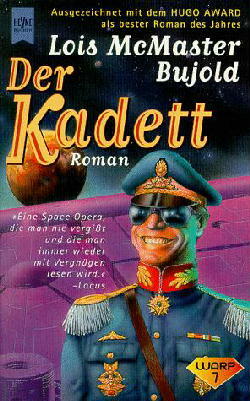 Bastei Lübbe one of the 3 or 4 German publishers with an own SF line was famous or infamous for putting soup ads in every novel. They used the characters of the book but were clearly recognizable as ads. (To Germans anyway). I’m not sure if they still do it, i haven’t read a translation for 20 years, like most Germans posting here i prefer the originals. For all the reasons stated here, changed titles, stupid covers, bad translators and even soup ads. I am sure everybody who reads English and German books alike knows about the various title changes. Just try to find the original title in English is sometimes a real challange. As for marketing. When I first saw the “Krieg der Klone” in the shelf I moked about it towards my girlfriend. That title sounded so ultra trashy. I went around it for months and not even touched it. So much about the marketing… Go free e-books! By the way: is there a printed version of Agent to the Stars available? I need to own that in print!! Maybe in German? I have tons of people who need to read this but don’t speak enough english! Years ago I loved the Battletech series. Is it even called Battletech in the US of A? When you are a devoted follower who knows all the Mechs, flags and symbols, one quickly realizes that they exchange the covers between the books. So in a series of 3 the english covers are 1, 2, 3. The german version shows the covers 2, 3 and 1. Why is that? Does anyone have an explanation? @43 Tobias, you may be right, maybe it was soup, and not tea, the conversation happened a few years back and the details may have been blurred. I still find it interesting that a publisher can get away with such things. 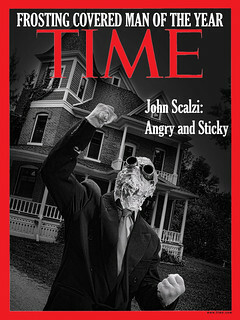 Actually, that cover looks pretty cool. 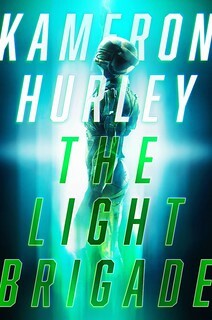 Why do European books always get cooler covers than their American counterparts? Between the Planets isn’t a horrible alternate title, at least, since Zoe’s Tale deals with moving to new homes and new lives as one of its themes. It’s vaguely appropriate, sort of. Maybe. Eh. Be happy that the mayhem was limited to the title. In one of Heyne’s translation of Niven’s “Gift From Earth”, the translator actually changed the ending of the novel: in the original, the protagonist, who can make people forget that he is there, decides that he will be the guardian of the new government and make sure that they don’t turn into the old government (the society there was caste-like with poor folks going into the organ banks to keep the descendants of the original colony ship’s crew); the translator turned that into something very similar to some sort of socialist bleating about the dawn of a new day for humanity now that the wicked elitist warmongers that made up the descendants of the crew were deposed, with the protagonist putting his arm around the girl and looking off, Soviet realism style, into the sky. Ever since then, I refer to Heyne as “Heinous”. Mike@40; Your reference seems to confirm ATMachine’s statement that the specific title (though not, of course, the need for a change) was Rowling’s idea. I still think something more generic would have been better; the change to ‘Sorcerer’s Stone’ meant that the name of the stone also had to be changed, thus losing a significant real-life reference. Apropos of other remarks above, I did see it proposed somewhere, before the actual title of the last book was announced, that Rowling should cause confusion by calling it Harry Potter and the Sorcerer’s Stone. This would not in fact have been a totally inappropriate title, since ‘Sorcerer’s Stone’ would be a suitable name for one of the artefacts which features in Deathly Hallows. I’m curious what the cover would be should you name a novel “laser beam-firing ships.” Possibly they would go with a photo of a puppy golden retriever. PS Call me should your book tour ever cover Berlin or Vienna. Regarding the Niven novel, I wonder whether Heyne didn’t republish an East German translation without checking it first. Or the translator had a political axe to grind and no one noticed. The soup ads are common knowledge as they are in many SF of Fantasy books at least since the early 70ies (according to the book collection of my father) we had actually contests of finding the soup ad as fast as possible by flicking through the pages. There isn´t that much danger of mistaking them for parts of the story as they are always on a extra page, have different font or blackened lines and often also a small depiction of the trademark. On top of that the ad text is always a repitition of a scene directly previous to the ad only with eating soup (and sometimes really drinking tea… the ads were for Maggi soup or Teekanne tea) into the text. First, yes, translations are paid badly and translators have to produce a lot of paper/day in order to make a decent living. Therefore, there is not much time for revisions, contemplation and stylistic detail, as the novel has to be finished, another one is waiting and bills have to be paid. That’s simply a fact of life and so much I’d like it to change, it is necessary to point out that German MMPs are already more expensive than US ones, increasing the translator’s bill would make them even more expensive which would lead to diminishing sales. Secondly, some English titles which sound nice and interesting in English do not translate well into German. As Markus has said, “Old Man’s war” in German would imply the adventures a space-faring hostel for senior citizens, which is not really what the novel is about. I agree that some alternative German titles are as problematic, but many times a direct translation is not feasible. As Markus has said, “Old Man’s war” in German would imply the adventures a space-faring hostel for senior citizens, which is not really what the novel is about. I’m going to write that novel now, though! On a similar topic, when Alfred Hitchcock adapted W. Somerset Maugham’s novel Ashenden for the screen, he called it Secret Agent, because “Ashenden” didn’t have that zing. But then when he adapted Conrad’s novel The Secret Agent, he was kind of screwed. So he called that one Sabotage. Later, Peter Viertel (and others, including Dorothy Parker) wrote a script called Sabotage. Hitchcock wound up getting attached to the picture, so to avoid confusion, they named the thing Saboteur. There is a long, sad list of poor translation of titels. Especially in the 70ties the was completely horrible. For example: “Logans Run” was translatet in “Escape into the 23rd Century”. Hell, they must have been on drugs all day long. In the 70ties, they would name you first book “A Dirty Old Man on His Way to Hell.” So consider yourself lucky. Today it is a bit better, but still there are many times I completely disagree with the titel. In the end of course you get used to it. And everything, what Dirk wrote is true. The German SF market besides of Perry Rhodan who still interest an incredible amount of readers is very small. A book that sold more than 10000 copies is considered as a major genre bestseller nowerdays. They sell tons of Fantasy, but SF is different. But do not dare to start writing Fantasy novels. Just to add another novel: James Blish’s “Earthman, Come Home” was translated to “Stadt zwischen den Planeten” by the German publisher Goldmann. Doctorow’s “Eastern Standard Tribe” became “Upload”. And just to quote what is probably the longest title, where the translator might have mistaken himself for an author … “Pavane” by Keith Roberts translates to, and I will use the German title: “Die folgenschwere Eermordung ihrer Majestät Königin Elisabeth I.” Which is not so far from the content. As for title-conversions it’s quite surreal though. As for covers: Publishers go with the trend and with common symbolism. Hardly any publisher worldwide is willing to risk something these days. Dan Brown covers for example all look alike in Germany although especially his early stuff doesn’t fit with the “Da Vinci Code” (translated to “Sakrileg”, btw.) spleen. “Digital Fortress” was published in Germany as “Diabolus” well after “Da Vinci” and seven years after the original publication. Title and cover suggest: More of the same. And erm … in a way it is.